Heat the oil in a pot over medium heat. Add the pasta and fry, stirring until golden brown. Transfer to a bowl. Add the garlic and the rice. Fry, stirring for one minute, and add the broth and the salt. When the broth comes to a boil, cover the pot and reduce the heat to its lowest setting. After 10 minutes, add the quinoa and the fried pasta. Stir everything together with a fork, cover again and continue cooking. Wait 10 minutes, and add the peppers and cranberries. Cover the pot again and continue cooking for another 10-20 minutes, until the rice is cooked. If the broth runs out before the rice is ready, add some hot water to the pot. 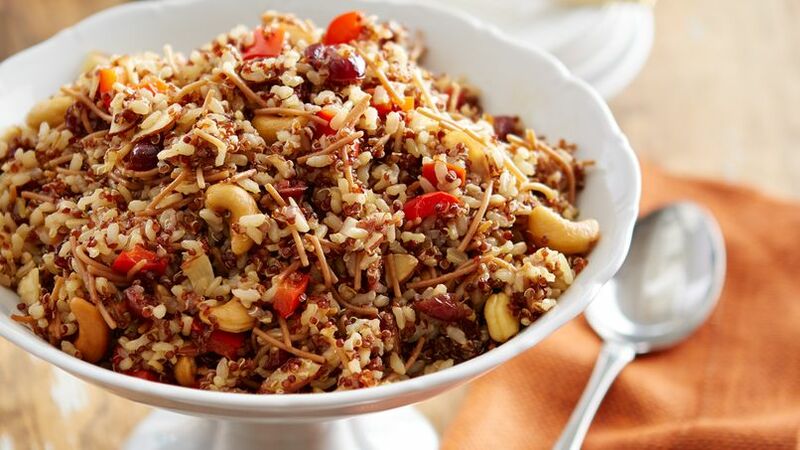 When the rice is ready, add the nuts, stir once with a fork, cover again and let it rest for 5 minutes before serving. You can use any kind of nuts to make this rice. Almonds are the original ingredient, but you can also use pistachios or Brazil nuts. If you want to give the rice a sweet touch, you can dissolve some honey or maple syrup in the broth before putting it in the pot. Morena Escardo Arroz moro is perhaps one of the most traditional holiday dishes in Peru. This rice is usually served with turkey on Christmas, or with salads, and apple and sweet potato sauce. Here’s my version!